May was a good time for a barbeque and trekking :) So here is a brief digest, hopefully not so much news means more bugfix and docs work from Yii Team towards stable RC. Documentation translation is started. Select some ready made En guide section and move on like Ru example. No Ubuntu Juju Charms support out of the box. No .htaccess in example app. ...since nowadays nginx usage is very high and .htaccess is useless for it and many other webservers. kPHP in Yii framework? Definetily not, while kPHP does not support OOP. With nowadays web technologies anybody could try any web product with minimal efforts and completely safe. No more need to install and adjust tons of software, no more fear to ruine your working OS with another one server etc. I was dreaming making sandbox for Yii2 playground with Vagrant and Ansible from the first day I have learned them. So ... here it is on Github. Go ! And those who is not realy familiar with Vagrant and do not understand what I am talkign about - please read my post about Vagrant, you will love it. "Try Yii2" provides you with Vagrant file and Ansible provsioning scripts. Vagrant will launch the VirtualBox VM, download OS image, deploy it and then run Ansible. It will set up all needed software inside Linux VM, clone Yii2 project, download test DB and connect it with project. Also Vagrant will modify you hosts file and assign special local domain adresses with VM IP address, so you will be able to access test Yii2 prject by humanreadable local domain name. All these steps will be made completely automatically, just run vagrant up and wait ! Local IP loop on Host machine /etc/hosts and Virtual hosts in Nginx already set up too ! On other host OSes potentially you will need to change some steps (like the way of Vagrant plugins installation and Terminal usage). If you have issues on other OSes and have solved it - please send me comments here or on GitHub, to add some solutions to the docs. You don't need to have Ansible installed on host machine. It will be installed on VM and self-provisioning will be launched. So it is possible to run everything on Windows machine. It will start VM creation and Provisioning. Could take some time 15-30 min... Drink coffee and get back for complete virtual server with Yi2 project ready for play ! Are you getting visual information better or want to have clear representation of all Git operations ? githowto.com it was the first interactive tutorial I have found. Simple and brief. 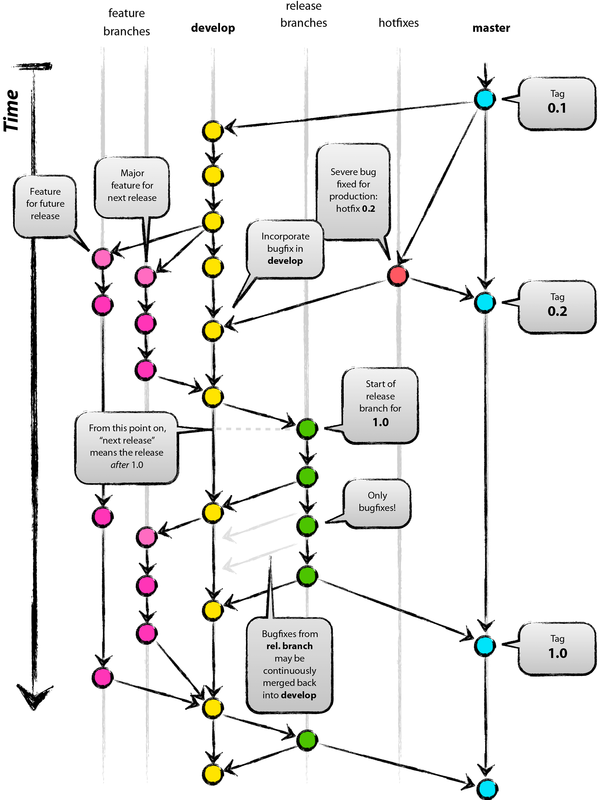 Learn GIt Branching - very nice made and interactive. You should definitley atleast look on it. Thanks for a big PR campaign by Alexander Makarov (@sam_dark), previous dev digest was seen by more than 5500 people. Quite impressive and gives me more inspiration to make new reviews! As usual - Russian version of this digest is available (see the link above) ! Yii 2 beta Released on April 13. Official press-release is great in details, you should definitely read it through. Russian press-release. Yii2 now follow PSR-2. Yes "Space" intendation wins. Now tools like PHPCodeSniffer will work with Yii2 better. It is not about pro-contra features, it's just about having the same standard across the PHP world. Dependecy Injection container out of the box. Yii2 is not migrating completely to DI concepts, but gives you an utility class for DI in your app. Introduced universal URL helper class. Samdark made a good explanation in Russian in his blog also in Beta release notes it has good usage examples. Very handy helper class! Remastered RBAC. Biz rules are separate classes now, no eval. Conditional validators. Custom anonymous function when could be use with all validators to have additional control on validator usage. Also whenClient for a client side. REST Api got more improvements, but still something left fot RC and GA releases. Added separate bootstrap ability to init different Classes on each App run. Similar to former preload, but now it is unified way for Extensions and Components. Added loadDefaultValues for AR Model. As a generic way to set default values and not overuse "default" validator or custom init. More consistent AR find() usage. Introduced findOne and findAll. Added PrefixUrlRule that represents a collection of URL rules sharing the same prefix in their patterns and routes.. It is best used by a module which often uses module ID as the prefix for the URL rules. There will no be offficial out of the box integration with Bower. It's considered not a server-side framework core issue - and I am agree with it. In any case thos who need it - will find a way to use with his tools stack. 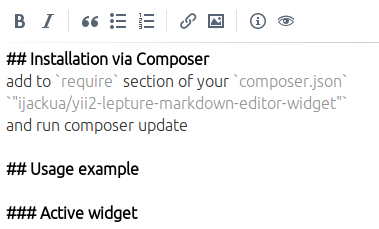 Uses https://github.com/lepture/editor - "a markdown editor you really want". I am using this editor on my blog and prefer it over EpicEditor. It's much handy to write posts with realtime basic highlight of Markdown syntax.